Did your parents spank you when you were a child? Then you'd probably think that it's a good way to curb your child's behaviour. If you were spanked and you think you came out alright, it definitely wasn't because of spanking and you'd be better if you hadn't been spanked at all! • It teaches your child that violence is an acceptable way to express anger. • Intentionally instilling pain on your child is cruel, even if you believe that it is for his or her own good. The slogan "No pain, no gain" does not apply to child rearing. • Spanking is emotionally harmful for your child. It makes a child feel that there's something wrong with him or her and creates resentment which may eventually lead to self esteem issues. • Spanking damages your relationship and trust, invades a child's sense of security and stops the progress of effective communication. • It is disrespectful to the child, and it doesn't help teach respectful values and standards. • Spanking fosters lying in children who are desperate to avoid being spanked. • Spanking is also related to mental health problems including anxiety, depression, drug and alcohol use as they grow older. 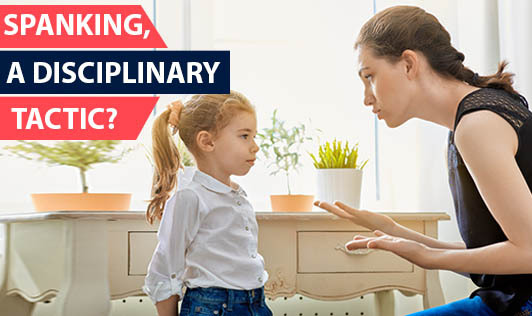 There are alternatives to spanking and hitting your child, that can help parents raise healthier, well behaved children through non-physical means of discipline. You can try a combination of prevention, positive reinforcement and non-physical discipline. PREVENTION: Create a home where it's easier for your child to be better behaved and productive especially one where you are less tempted to resort to spanking. • Teach your child to talk about his or her feelings rather than act them out in misbehaviour. • Anticipate stressful situations and develop different ways of handling your child before his or her behaviour gets out of control. • Be patient, and remind yourself that your child requires repetition before he or she can understand and remember what they are supposed to do. • Monitor and acknowledge your own levels of anger by being aware of what may trigger angry responses. POSITIVE REINFORCEMENT: Your child will learn more about good behaviour from being told what they're doing well rather than what they're doing wrong. Remember to take time to praise and encourage your child especially when he or she is doing a good job and behaving well. NON-PHYSICAL DISCIPLINE: This proves to be more effective than spanking your child! • Explanations and reasoning are definitely the first line of approach, but they need to be appropriate for the age of the child. • Time outs usually provide a space for breaking out of the cycle, calming down and trying again. • Distraction is also very helpful with young children. When a child misbehaves, it may quickly end if the child can find a better alternative. • Verbal reproach and reminders work best when they focus on the problem behaviour. So, it's very important to emphasize what's wrong with the action. Never say "You're a bad kid". Instead, say "what you did wasn't right". • Lastly, loss of privileges should be a final recourse. If explanations and reminders are not working in a particular situation, then a child needs to experience logical consequences for misbehaviour. The secret is that spanking and hitting not only fail to discipline a child, but is totally unnecessary! So, the next time you get so angry that you want to spank your child, tell your kids to take a time out and that you'll deal with them later. Keep in mind that when children are raised with age appropriate expectations and limits accompanied by empathy, they tend to behave and cooperate! Such children don't need much time in the way of discipline at all; they become self- disciplined adults!